Fans of real chinese furniture lacquered admire in this collection whose representation is as accurate as the reality of a work of art. Vietnam, China creates since several millennia of artistic furniture of unsurpassed beauty. Chinese furniture and decorations that we present are made according to the ancestral know-how of the master cabinetmakers chinese. All of these lacquered furniture chinese are made by hand in the unit, painted and decorated by hand by locals. In fact, each piece of furniture will be different from the other, as in the lacquers or the drawings in the arrangement of the motifs (flowers, birds, characters). The procedures of lacquer furniture chinese or decoration vietnamese require a painstaking work and a lot of attention, the lacquer will harden in a few seconds in contact with air. The lacquered furniture chinese presented on our website can be ordered in the colours: White - Bronze – Red - Black - with or without inlay of mother-of-pearl. Authentic chinese furniture old are more coveted in our European countries because they reflect tradition and history of their home countries, and bring serenity and well-being. These genuine chinese antiques are increasingly difficult to acquire, the extension of the product, and too many bad copies of chinese furniture antique are the cause. This is why we remain faithful to the partnership sealed for 20 years with these same artisans of the suburbs of Beijing. They buy of exceptional pieces in the countryside, in homes or on the village markets and the need to restore these chinese furniture in their workshops. The species of wood that were used for the production of chinese furniture are different. Include catalpa, elm, camphrier, pine, tropical, beech, fruit trees, the poplar, the cypress, the cedar. Furniture tibetan high in color thanks to the talent that the elders passed down for millennia. Create in your home an atmosphere out of time and full of character by highlighting one or several pieces of furniture tibetan. We offer these furniture tibetan-to-measure solid wood recycled, made in the ancestral manner to the tenon mortise, by a family of craftsmen, with whom we are in partnership for the past 5 years. Order your furniture tibetan to the unit ON MEASUREMENT. This line of furniture chinese surprised by its quality, following a purely artisan marking another era. The representations of scenes of ancient times are hand-painted on a material combining certain properties and the feel of the leather. All the interiors of this collection of chinese furniture are covered with a copy of lunar calendar which has always guided the chinese in their daily lives. Reproductions of chinese furniture are assembled in a factory in Ningbo, a city bustling commercial south-eastern China. A lot of chinese furniture manufactured in the string are to be sold on the european market with distressed effect by blows of the hammer and lack of paint to give the appearance of furniture antiques. Reproductions of chinese furniture antique that we offer is of a fidelity that is remarkable. We make it a point of honour to manufacture of chinese furniture to the unit in the pure tradition, solid wood recycled including the finish and the patina charm our customers. You can order your reproductions of chinese furniture bespoke to different shades. For millennia the tradition of the forge manual is perpetuated in the historical cradle of its creation. The technique of forging the most sophisticated is called "Soshu Kitae" in japanese. The blade is made of 7 laminates and 3 density of steel different. The sword is fully hand forged using the technique of the Master blacksmith Masahiro in the mountains of central China where for more than 2000 years, the craftsmen use the art of blacksmithing to the ancestral. These pieces are as unique as those used since the dawn of time by the emperors, and warriors of the Middle kingdom. They are in a wooden scabbard (shirasaya) or in a frame, conventional (koshira), swords need to be kept in their case. When you carry a sword, make sure that the handle (tsuka) is positioned higher than the scabbard (saya). To draw a japanese katana, push the guard (tsuba) away from the opening of the scabbard with your thumb. Drag slowly by avoiding contact with the edge of the blade with the scabbard to prevent the blunt. Always store your sword horizontally with the cutting edge (ha) up to the top. WARNING: The blades of these reproductions of japanese swords are extremely finely honed and can cause serious injuries. Don't forget the items of Feng Shui. More than an art, it is a science of energies of our environment. These various objects of Feng Shui placed conveniently allow your place of dwelling or work to be in harmony and your well-being and health will not be that improved. 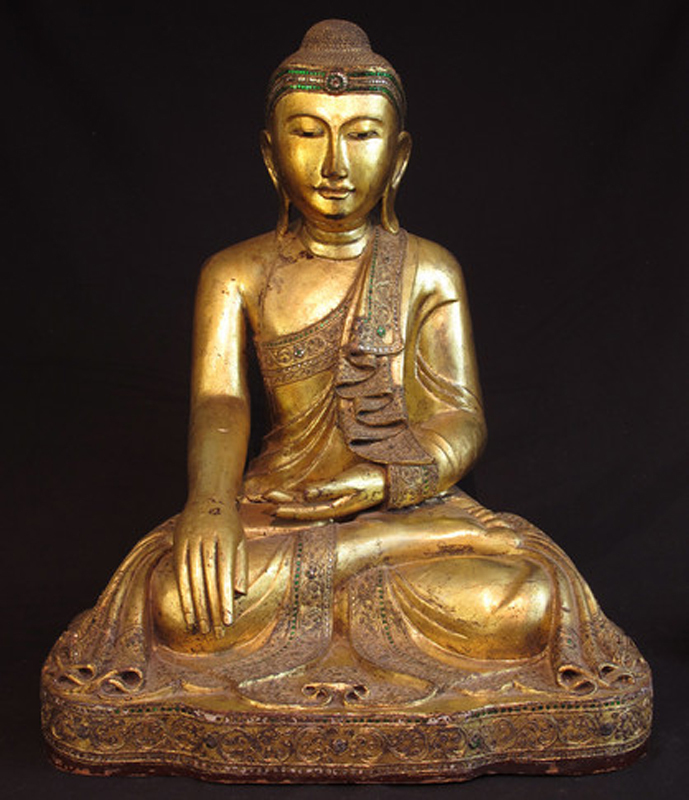 The ancient texts have guided the painters and sculptors in the reproduction of the real Buddha. Since then, a set of characteristics that are immutable are met. The standing Buddha. The Buddha sitting in the lotus position. The Buddha lying on his side a hand under the head. Several variations come filled with these statues. What are the positions of the hands giving a particular meaning of the Buddha's teaching. Do you know also this chinese Buddha portly and always happy? His representation would come from China of the X° century, representing a monk ch'an, named Pu-Tai : by sounding the Buddha. His overweight is synonymous with opulence. This is a chinese buddha cheerful desire, it is the happiness of living when he is represented surrounded by children. It has the meaning of the family and pronounced the door of the bags of precious metal is a symbol of wealth. We offer you in the topic ready-to-wear chinese clothes, chinese as a whole Kung Fu in wild silk, clothing viêtnamiens robes reversible with embroidery and refined in the reflection moiré, clothing, japanese yukata and haori for example. You will be glad to receive your friends in this chinese dress, holding inside that you get the effect is both relaxing desired. The elegance of the clothing chinese will also allow you to be envied at social gatherings. You are in search of exoticism, garment, chinese you will provide. The stoles, shawls, silk scarves from Laos were woven handmade on looms by traditional wood. Each scarf, shawl or stole pattern-weaving more or less complex, derived from customary practices, ancient and often specific. These patterns are often geometric or figurative (representation of stylized animals). The silk yarns are dyed from the maceration of natural products chopped or crushed : leaves, bark, minerals, insects, shells... The dyes are then fixed by various natural products in the plant following various techniques ancestral. The colours obtained are rich, vivid and bright. These weavings are distinguished by their plastic beauty, the multiplicity of techniques involved and their motives. Even today, their rules of composition, and their deep meaning keep all their secrets. Man-frog: going Back also to the time Yue but without doubt original austro-asiatic, the pattern of the male frog is closely related to the worship of the goddess-Frog, the progenitor of mankind, protector of the rice according to the myths, missing from our days in Laos, but still alive and well among the Zhuang (descendants of Laos according to the chinese texts of the Ii s. before J. C.), Guangxi (south China). The door-light: The figure is in the shape of an isosceles triangle, base elongated, containing in the centre, a "man-frog". It is interpreted in our days in Laos, under the buddhist influence, as a door-fixture. In fact, it is a coffin ship. The diamond or the eye of the sacred: the design in The form of concentric diamonds is called douang your (eye sacred) by the Lao people of the province of Samneua. This pattern, when it adorns a headdress of women, must be worn on the forehead. It is a yantra (diagram helping to the concentration) mahayanique, a native of Boutan, which was received probably in Laos north at the time of the Nan Zhao. (Dynasty founded in 737 of our era, and who ruled over the kingdom until 902). Ginseng corréen, native plant of North-East Asia, strengthens the body's defenses, helps fight against stress and aging. The ginseng root is known for its pharmaceutical properties. Ginseng the most famous is grown in Korea. Koreans call it "insam". The trade of ginseng is strongly framed by the State of south Korean, in order to ensure the quality of the label Korean Ginseng. The world health Organization (WHO) recognizes the use of ginseng to invigorate the body of people tired or weak, restore the capacity for physical work and intellectual concentration, and help convalescents to regain strength. The incense are involved in the energy favorable to your well-being. The incense produces a change in the atmosphere. It acts on the subconscious mind and the subtle bodies of the human being is in the uplifting, harmonizing or calming one of them. We have selected some incense that will provide the desired effects depending on your personality. Incense japanese: In Japan, the way of incense koh-do is a tradition of fifteen centuries. Japanese incense is all incense, the most delicate and the most refined. Incense chinese: The culture of incense in china is millennium. It is burned for offerings and the worship of ancestors. Incense indian: It is the image of this great people passionate about spirituality, surprising and spellbinding.